There are approximately 2,500 species of fleas in the world with over 300 species occurring in the continental United States. The two most common fleas in the northeast are the cat flea and the dog flea. The most commonly encountered species is the cat flea and is the flea most typically found on dogs and cats. Dog fleas are very similar to the cat flea but is much less common. Any flea control or treatment program begins with a positive identification of the pest involved and then a thorough knowledge of that pest’s biology, life cycle and habits. 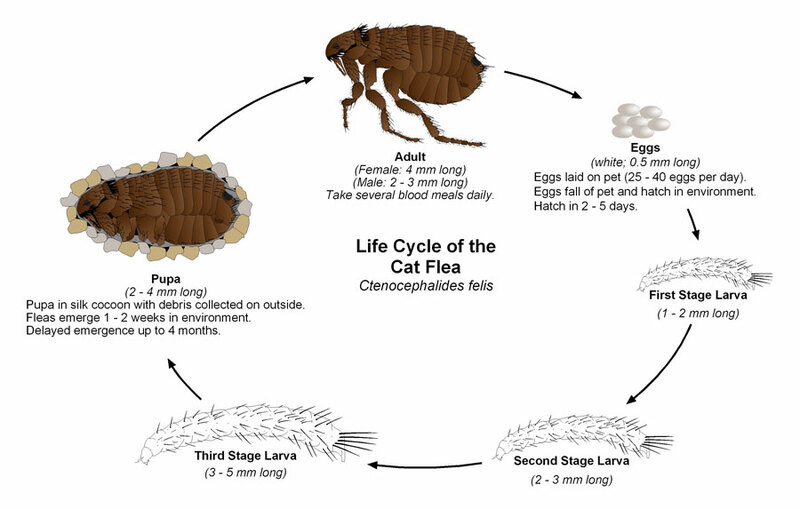 All fleas develop from egg to adult through a process called “complete metamorphosis” which means they have four different life stages: egg, larva, pupa and adult. An adult female requires a blood meal in order to develop eggs. She will continue to develop eggs as long as a blood meal is available. The female is capable of laying up to 40 eggs per day with up to 2000 potentially laid in her lifetime. The eggs are deposited on the host, however since they are not sticky or attached in any way to the host, the eggs soon are dropped, shaken or brushed off. These eggs will hatch within 2-5 days under ideal conditions. Tapeworm infections are common and found throughout the world. In the United States the most common tapeworm is Dipylidium caninum. Tapeworm larvae are transferred through the ingestion of an infected flea. Dogs or cats tend to swallow infected fleas while grooming themselves. Tapeworms are not usually harmful but weight loss may occur in severe cases. As with most types of insect bites, people tend to react differently from person to person. Reactions can range from mildly itchy short lived welts to symptoms such as lesions and rashes that can last a year or more.